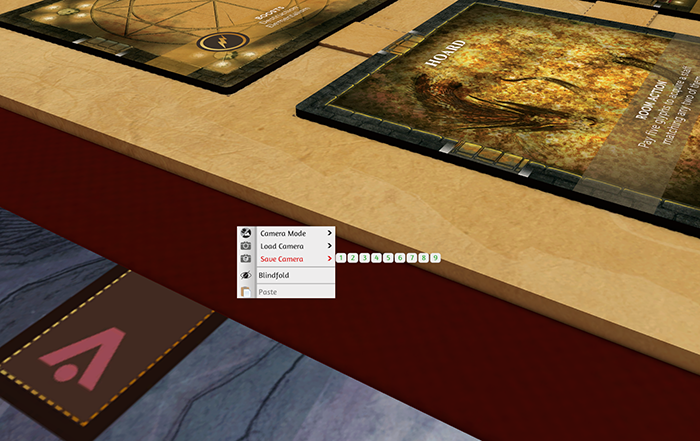 Camera states enable you to save different camera views into save files (individual mods/games) and share them with everyone else in the room. To save a camera state, move your camera where you want to save, then right click on a table or non-object and this will bring up the Global Contextual Menu. Click on Save Camera and choose the number you wish to save it into. Alternatively, you can use the hotkey Ctrl + #. To load up a camera save, open the Global Contextual Menu, click on Load Camera and choose the number. The hotkey for this is Shift + #. Camera states are saved per game, so they are not saved globally. This allows you to have different type of camera views depending on the game. You can also change your default seat position (spacebar) so everyone is sharing the same view, by positioning where you want the camera to be and using the hotkey Ctrl + 0. Now whenever anyone in the room presses the spacebar, they will all default to the same position. Users can change their own individual settings if they do not like the saved camera views.